Chief executive Carl Hall insists reaching Super League by 2022 IS a realistic target for Doncaster RLFC. The Dons launch their 2018 Betfred League One season at home to Coventry Bears on Sunday. 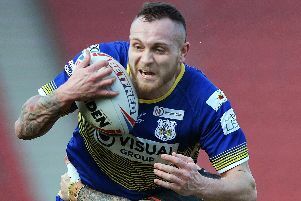 In an in-depth interview with the Free Press, Hall says the club’s primary objective is to get back into the Championship as quickly as possible. When they return to the second tier, he says the plan is then to become a full time operation. And Hall is confident the Dons could then launch a serious bid to bring top flight rugby league back to the town. “If we can get out of this league it’s definitely a realistic target,” said Hall. “The biggest stumbling block [...] is getting out of League One and it has been for a couple of years now. “If we could’ve got out in year one [of the five-year plan] then I think we’re two years ahead of where we are today. The Dons’ only season in the top flight was in 1994/95. They were relegated from the Championship in 2015. Meanwhile, Doncaster have been drawn at home to amateur side Myton Warriors in the third round of the Challenge Cup.